Be the first to share your favorite memory, photo or story of Nila. This memorial page is dedicated for family, friends and future generations to celebrate the life of their loved one. 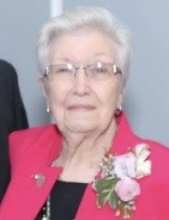 Nila Marie Southard, age 91 of Oakland, IL, went home to be with her Lord in Heaven on November 12, 2018. She left this life at her daughter’s home in Danville after a brief stay at Colonial Manor Nursing Home for rehab. Nila was born October 18, 1927 to Otha Carrel and Luella Fern (Whisnand) Duzan. She married Douglas Allen Southard on December 29, 1950 in Kansas, IL. After farming in Chrisman, IL until 1974 they moved to Queen City, MO to continue their farming operation until 1987 when her husband passed away. Nila moved to Oakland in 1988 from Queen City. She was a former member of WSCS Home Bureau, a former 4H Leader in Chrisman, a member of the Oakland Christian Church, and was active in the Oakland Senior Center. She enjoyed flower gardening, crochet, and was well known for her baking skills. Her scotcheroos, cinnamon rolls, persimmon pudding and peanut brittle were especially popular with her family, church and friends. She is survived by three children: Judith (Douglas) Taylor of Danville, IL, James (Jane) Southard of Perryville, MO, and Peggy (Roger) Wilcox of Livonia, MO; one brother: James Duzan of Statesville, NC; six grandchildren: Leslie Taylor Williams, Timothy Southard, Amy Southard, Daniel Snowbarger, Christopher Wilcox, and Whitnie Bass; and six great-grandchildren: Mackenzie Southard, Joshua Southard, Charli Snowbarger, Eliza Wilcox, Ezra Wilcox and Levi Bass. She was preceded in death by her parents, her husband, three brothers: Marvin Duzan, Erwin Duzan, Myron “Lindy” Duzan and twin grandsons Bradley and Brian Snowbarger. Visitation will be held on Friday, November 16, 2018 at Krabel Funeral Home in Oakland from 3:00-6:00 p.m. Funeral services will be held on Saturday, November 17, 2018 at the Oakland Christian Church at 11:00 a.m., with Pastor Chris Wilcox officiating. Burial will follow in Friends Chapel Cemetery at Scottland, IL. For those who wish memorials may be made to the Oakland Christian Church, the Oakland Senior Center or St. Jude Childrens Hospital. To send flowers or a remembrance gift to the family of Nila Southard, please visit our Tribute Store. "Email Address" would like to share the life celebration of Nila Southard. Click on the "link" to go to share a favorite memory or leave a condolence message for the family.